Cambridge researchers have created ‘mini liver tumours’ in a dish for the first time, which can be used for testing new cancer drugs. Cambridge scientists have created mini biological models of human primary liver cancers, known as organoids, in the lab for the first time. In a paper published today in Nature Medicine, the tiny laboratory models of tumours were used to identify a new drug that could potentially treat certain types of liver cancer. Primary liver cancer is the second most lethal cancer worldwide. To better understand the biology of the disease and develop potential treatments, researchers need models that they can grow in the lab and that accurately reflect how the tumours behave in patients. Previously, cultures of cells had been used but these are hard to maintain and fail to recreate the 3D structure and tissue architecture of human liver tumours. The researchers created the mini tumours (up to 0.5mm) – termed tumouroids – to mimic the three most common forms of primary liver cancer. Tumour cells were surgically removed from eight liver cancer patients and grown in a solution containing specific nutrients and substances which prevent healthy cells out-competing the tumour cells. 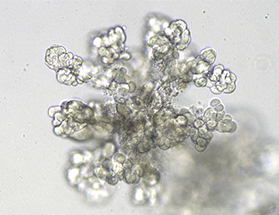 Dr Meri Huch describes her pioneering work on liver organoids and the mechanism of liver regeneration after damage. Dr Vicky Robinson, Chief Executive of the NC3Rs which partially funded the work, said: “We are pleased to see that the funds from our annual 3Rs prize, sponsored by GlaxoSmithKline, have furthered Dr Huch's research. Each year the prize recognises exceptional science which furthers the 3Rs, and the work being conducted by Meri and her team is continuing to make progress in this area. This new breakthrough involving liver cancer organoids has the potential to reduce the number of animals required in the early stages of liver cancer research, and provide more biologically accurate models of human tumours."